Images of a tiny red bird pop up everywhere in Venezuela. The finch-like red siskin appears on printed money, food labels, and the covers of school books. But despite the brilliant red plumage, finding a red siskin in the wild is getting harder and harder. What’s the answer? “More coffee!” say some conservationists. The little bird affectionately nicknamed “Cardenalito,” or “Little Cardinal,” is vanishing from the wild at an alarming rate. Poachers capture the birds to sell to canary breeders. Crossing the two produces unique orange feathers. A single red siskin can bring more than $300—months’ worth of income for a desperately poor family in Venezuela. Shrinking forests give the siskin fewer places to hide. The threat brought together an international team. Scientists from the Smithsonian Institution in Washington, D.C., joined with poor coffee farmers in Venezuela’s remote mountains. Together, they will work on rescuing the red siskin from extinction. The plan is to entice farmers to plant organic coffee groves with layers of thick branches. That bramble is inviting—and protective—to the perching songbird. Once flourishing in the millions, as few as 300 red siskins remain in the wild in Venezuela, estimates suggest. But it is difficult to determine numbers confidently in the politically turbulent and dangerous country. (See Dark Times for Socialist Venezuela on WORLDteen.) One scientist was robbed of his camera while tracking the birds. “They don’t have many years left,” says Miguel Arvelo. The veterinarian works with the Caracas-based nonprofit Provita, a group spearheading the effort. The Red Siskin Initiative to plant more organic coffee is funded by the U.S. Fish and Wildlife Service and private groups in America and Venezuela. Planting organic groves with thick branches reverses a trend. Farmers often boost bean production by thinning groves for more sunlight. Or they cut them down altogether to plant vegetables that turn a quicker profit. Farmers who meet the project’s standards will market their beans with “Bird Friendly” labels. They will also take advantage of a loophole in Venezuelan law to set prices for premium products, sometimes five times higher than caps set by the socialist government. Eventually the group hopes to export the coffee—increasing volume and profits for the farmers. Some 40 farmers in the rugged, coastal mountains have already agreed to stop cutting trees. That’s an important first step. 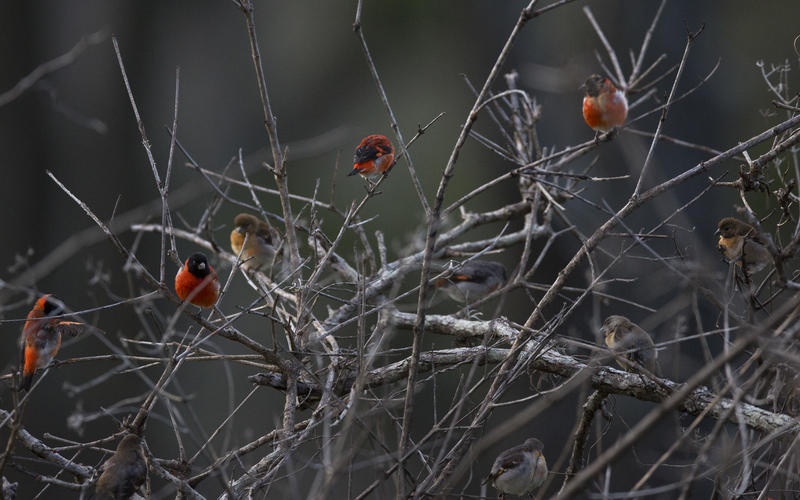 Simultaneously, a red siskin breeding center is being built at a private Venezuelan zoo. About 200 birds are expected to be hatched there next year. A few dozen more are caged at the Smithsonian Institution. Red siskins from the center will be introduced into the coffee groves. Why all this effort for one small bird? Biodiversity is essential to nature’s balance. God instructed Noah to preserve every kind of animal. (Genesis 6:19-20) Conservationists at the Smithsonian saw a connection. They referred to keeping siskins there as “a sort of Noah’s ark” preservation of the species. Haha.that's OK, and a little funny. Any plan that grows more coffee beans for the world is fine with me! I love coffee! The birds are so cuteeee!